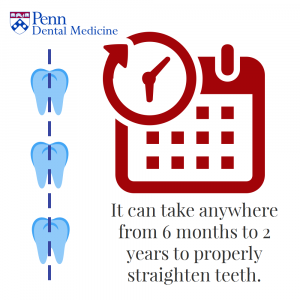 It can take 6 months to 2 years to straighten teeth. Given the current economic climate in America, many individuals are on a mission to get more for less. Value is important and many count on their ability to obtain an outstanding product for a low dollar amount and without a large time investment. As a dental clinic, we recognize these needs, and we seek to provide the best value possible on dental care. If you’re looking to straighten teeth for less money and in less time, chances are you’ve already asked the following questions but we’ll take the time to answer them in-depth and honestly. Can I Straighten Teeth for Less Money In Less Time? How long does it take to straighten teeth the traditional way? According to The Dental Guide, straightening teeth can take 6 months – two years, on average. However, this answer comes with several caveats. Each person has a different set of teeth, hence different needs. In fact, it’s rare that a person have an even 32 teeth, and which tooth is missing from birth can have a big impact on the work that needs done shifting and aligning. There are multiple factors to take into account, not just frontal aesthetics. If you have an overbite, or if your arch is collapsed, a good orthodontist is going to take the time to rectify these issues, since they can have an impact on both your dental health and comfort later on, as well as post-braces shifting. 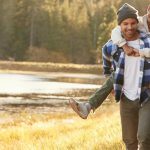 Another complicating factor is wisdom teeth–the state of your wisdom teeth will also impact how much time it will take. Dental hygiene levels have a big impact on the length of time it takes. Dentists are forever telling us the importance of dental hygiene, but did you know that dental hygiene while wearing braces can have a significant impact on the amount of time you need to wear your apparatus? In fact, food pieces and particles can get in the newly-created spaces and block the movement of your teeth, effectively slowing down the whole process. That’s why great dental hygiene is one of the most effective ways to straighten teeth in less time. Is there a way to straighten teeth quickly? If you’re wondering how to straighten teeth fast, it is possible to reduce the traditional time it takes to straighten teeth. Six Month Smiles, micro-osteoperforation, acceleDent apparati, and Propel Alveocentesis each offer methods to speed up the process of fixing your smile. However, Penn Dental Medicine does not offer many of those procedures. While they may save time, it’s not an effective way to straighten teeth for less money. It can also be difficult to find the time to come in for weekly or bi-weekly visits, and some patients are uncomfortable with the removal of tissue, the cost of the apparati, and the micro-cuts to the bone. Now that you have all the information on how to straighten teeth with less stress, contact Penn Dental Medicine to see how you can straighten teeth for less money. Penn Dental Medicine is the discount dental clinic that offers reliable orthodontics at discounted prices. Call today to get a consultation and find out just how much money you can save.